The Trojans will open conference play with a home game at Trojan Coliseum against the Rock Hill Redmen. First year senior quarterback Danny Lattimore hopes to lead his team to their first home victory of the 2018 season. 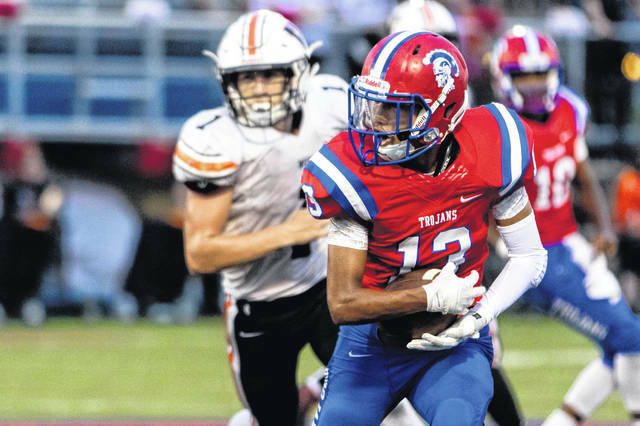 If the Portsmouth Trojans wish to make supplant themselves firmly into the currently wide open OVC race, they have to win this week’s game of the week in Scioto County against the Redmen of Rock Hill. The leader in the clubhouse for this year’s OVC race is most likely the Coal Grove Hornets, who fell to the Portsmouth West Senators last Friday night in an over five hour long game, 21-14 at The Rock. The Trojans and the Hornets share a common opponent in the Senators, a team who Portsmouth lost their home opener in week two to, 13-0. But before the Trojans think dreams of that all important week six road trip to Coal Grove, they cannot overlook Rock Hill. In their first game of conference play, Portsmouth will have to step up to the challenge of winning a must win game if they have their eyes set on a conference championship. On the other side of the field will be the Redmen of Rock Hill, who will travel west on US Highway 52 touting a 1-2 record so far in 2018. Rock Hill lost their week one opener at home to a currently undefeated SOC II Minford Falcons team, 27-20. They came back in week two with a road shutout victory over the Northwest Mohawks, 33-0. In week three, the Redmen were one of the many teams in the area who faced a severe delay in their rivalry game against the Oak Hill Oaks. Ultimately, in the two day long affair, the Oaks would prevail Saturday night by a final score of 34-29. The Trojans opened up their season in impressive fashion with a road victory in Lucasville against the Valley Indians, 57-40. Portsmouth lost their week two matchup at home against West 13-0, as stated above. The Trojans were not as impacted in week three as many other local teams were in their trip to Bidwell to face River Valley, ultimately resulting in a Trojan victory, 35-7. The consistent theme in the Trojans two victories so far in this season: rushing. Their two headed rushing attack led by junior Talyn Parker and senior Tyler McCoy has caused problems for the teams they’ve faced this season not named the West Senators. 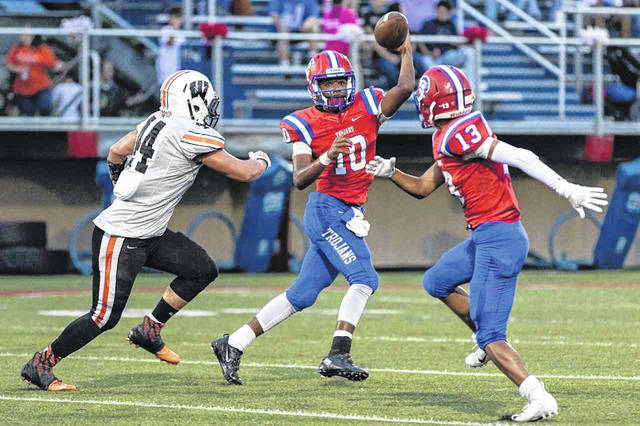 The Trojans gained over 550 yards of offense in their week one trip to Lucasville but were held in check to only 76 yards of offense against the Senators. In week three, Portsmouth gained 474 yards of total offense in their road trip to Bidwell, 280 of which came on the ground from Parker. For the season, Parker has gained over 600 yards on the ground and six rushing touchdowns in just three games. If the Trojans are hoping for a playoff spot and a possible run towards an OVC championship in head coach Bruce Kalb’s first season, they have to win their second home game of the season against the Redmen. And to do that, they have to continue to establish the run behind tackle Colin Boehm and tight end Parker Johnson. Kickoff for this Friday’s contest between these two OVC contenders at Trojan coliseum is slated for 7 p.m.